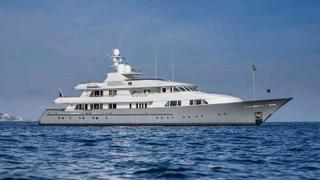 The 56.5 metre motor yacht Hampshire I has been listed for sale by Cecil Wright & Partners. Built in steel and aluminium by Dutch yard Feadship to a design by De Voogt, Hampshire I was delivered in 2001 and refitted in 2016/17. An interior by RWD in warm mahogany panelling accommodates 12 guests in six cabins comprising a master suite, two doubles, two twins and a single cabin with a Pullman berth. All guest cabins have entertainment centres, television screens and en suite bathroom facilities while the crew quarters sleep 14 staff aboard this yacht for sale. The interior is decorated in satin-finished mahogany with leather and chrome highlights, while a particular favourite with guests is the sky lounge. There, a pair of easy chairs and a sofa, upholstered in white, are grouped around a coffee table and face a flatscreen television set for a perfect night at the movies. A wet bar is forward to port and glass sliding doors open this room to the boat deck. Deck areas are spacious and include al fresco dining options on the large aft deck and the spa pool deck. Her top speed is 16 knots and she boasts a maximum cruising range of 4,700 nautical miles at 13 knots with power coming from two 1,520hp Caterpillar 3512-B-DITA diesel engines. For enhanced safety and comfort, she is fitted with zero speed stabilisers. Lying in the South of France, Hampshire I is asking €19,950,000 with VAT paid.